A "video-digitiser" (also known as a "frame grabber") captures still frames from a TV set, video camera, or video recorder, etc., and forwards them to a computer for display, storage, or general manipulation. This document describes the MarkII version of a home-built digitiser which interfaces to an EPP parallel port on IBM PCs. MkII supports colour captures (PAL/NTSC decoding in software). Note: the Bt218 chip, around which this project is based, ceased to be manufactured during the year 2000. If you want to build this project as shown, ensure you can get some old stock! Alternatively, you could adapt the circuit to work with a different low-cost ADC, such as the TDA8703 from Philips. I have not done this myself yet, so cannot offer details. You might also want to check out my earlier (Mk1) digitiser page, which includes more background information, particularly on video signals and timing. 12-15MHz pixel clock (depending on crystal/osc), giving images ~730 by 288 pixels. Eight bits per pixel sampling, colour decoding in software. Very high quality PAL colour decoding in software (not real-time, few seconds per image). NTSC colour in pipeline! Requires low voltage power supply (circuitry runs off +5V dc internally), 200mA typ. Total electronic components cost (one-offs): approx. 50 pounds sterling as at April 1999. Add extra for circuit boards, boxes, cable, connectors, power supply, etc., if required. Image capture (16-bit application) to work under Win31, Win95/98, WinNT. Prototype colourisation (32-bit app) for Win95/98/NT (requires at least 32768-colour display settings). Still only captures one of the two interlace fields (though often the second one would lead to motion blur anyway...). Limited by mere 256kB of buffer. Published design captures odd/even field at random, though by simple modification you could ensure one or the other is guaranteed. Digitisation clock arrangement shown is not fully phase-locked to the linesync. A proper line-locked sampling clock could quite easily be implemented as an extension to the project. In general, horizontal resolution is decreased in domestic video recording formats (and colour is really seriously degraded). Use off-air signals from a good aerial for best results! Example colourised image, digitised, I think, from ITV's Cook Report programme, 7th February 1999. Off-air from the Crystal Palace transmitter, London. (This image is from only one field, so the height needs to be doubled to obtain the correct aspect ratio). It was digitised with a 14.161Msps clock, partially phase-locked to the line-sync. The ADC converts the incoming composite video signal to a digital representation, sampled typically at 15MHz. This data rate is far too fast for the parallel port to cope with directly, so instead the circuitry is arranged so that data from ADC is fed into a high-speed 256kB field memory. Video timing logic uses line and field synchronisation signals from the sync-separator to ensure that storage begins and ends at field boundaries, and that a fixed number of samples (pixels) are collected for each video scan line. PC parallel port interface logic controls the output of data from the field memory to the host PC, and temporarily halts the refreshing of the image in the memory while data is being read out. IC 8 MSM518221A-ZS-30 256kB field video memory OKI semiconductor ZIG-ZAG package! Data sheets for the 74HC logic family are available in PDF format from the Texas instruments website. The MSM518221A-3Z ??? is supplied in a "ZIG-ZAG" package, with two rows 0.1" apart, of pins on 0.1" spacing, with the two rows offset by 0.05". This will not be an issue if designing a PCB, but for breadboard or Veroboard construction you will need to make an adapter! For convenience, the circuit is drawn in three sheets: 1) showing the analog and digital video signal path, including parallel port interface, 2) showing the clock and video timing, 3) the voltage regulator. Errata: In the diagram below, the connection to pin 12 of the Bt218 ADC (clamp input) should come from pin 2 (the output) of inverter IC2a, not from pin 1. Diagram 1:Main circuit diagram, showing analog and digital signal paths. Diagram 2:Clock, and video timing logic. MSM518221 - WE enables data to be written and forward the Write pointer, IE when low, allows the write pointer to be forwarded, but inhibits overwriting of data. Reset Write Pointer (RSTW) is semi-synchronous - supposed to only lower for one cycle at a time - does NOT hold the Write Pointer at the start indefinitely!!! This explains why some of the WE logic is less simple than it might be. CAUTION if modifying my design! On the Bt218KP the colour subcarrier trap is shown with component values for UK standard PAL: for NTSC, use two 220pF capacitors in paralllel to make 440pF to attenuate the 3.5MHz signal. The subcarrier trap is ONLY required when obtaining black-and-white captures from colour signals, or when the sampling rate is too low to sample Fsc properly (eg less than 12MHz). IC5b ensures that data collection starts/stops only on field boundaries. The D latch is clocked on the field-sync, with data input (enable/disable collection) being derived from whether or not data is in the process of being downloaded to the PC. The logic (part of IC9 and IC10) to the right of Sheet1 are concerned with creating an EPP-compatible interface to the parallel port. IC11, the 74HC541 eight-bit buffer, buffers the output data to the computer, giving sufficient drive on the cable. NOTE: data lines to the PC should be fitted with 4k7 hold-down resistors (not shown). More information on EPP interface is to be found in my original digitiser write-up. Sheet2 shows one possible configuration for the clock and enable logic. IC6 has a special task in that it counts past the first 10 "lines" - some of which are in reality only half length - and inhibits collection of those - otherwise the captured picture would sometimes wrap-around. Reset logic to IC4 is a crude attempt to give pseudo line-locking of what is essentially an asyncrohous clock. IC5a in conjunction with the binary counter output ensures a controlled number of samples are made per video line [timing diagram required]. Sheet3 should be self-explanatory. The low-voltage PSU should be capable of delivering at least 200mA. If the input voltage exceeds say 12V, heat dissipation in the 7805 may become a problem. In theory, to get a picture with "square pixels" (ie. perfect aspect ratio) a clock rate of 14.75MHz is required for PAL pictures (12.273MHz for NTSC). For colour decoding, there is some advantage to be gained from having a sampling clock which is an exact multiple (usually 3 or 4 times) of the colour subcarrier. For PAL, Fsc=4.43361875MHz, so 3Fsc=13.301MHz, and 4Fsc=17.734MHz. With NTSC, Fsc=3.579545MHz, so 3Fsc=10.738MHz, and 4Fsc=14.318MHz. There is also a CCIR international standard rate of 13.5MHz for digital video, but this is of little significance for this project. It is preferable to have an integer number of samples per line, to prevent pixel, or sub-pixel, interline horizontal jitter or drift. Since a horizontal scan lasts 64us, the total number of samples per line is simply 64 times the clock frequency in MHz. There are digitiser clock-generator ICs on the market which generate line-locked clocks of all the standard frequencies given a video signal. I did not opt to use one of these owing to the cost, added complexity, and possible difficulty of obtaining supplies. Sheet 2: there is some uncertainty as to which pin of IC4 (74HC4040) connects to IC5a. The 'Q3' designation doesn't tally with 'pin 5' shown. Sheet 1: the connection to pin 12 of the Bt218 ADC (clamp input) should come from pin 2 (the output) of inverter IC2a, not from pin 1 as shown. Where should I connect "RE" and "OE" pins in the IC8(MSM518221A)? My MSM518221A manual is too confusing. I have problems how to connect it. If you have the ZIP (Zig-zag) package, then if you hold it with the printed side facing you (there should be a small dot in the top-right and bottom-left corners), then... The pins nearest you are the odd-numbered pins, beginning 1,3,5,7... from the left. The back pins are 2,4,6,8,... also from the left. I was going to reproduce the diagrams a little larger and make the corrections, but since the obsolecence of the Bt218KP, this probably won't happen. 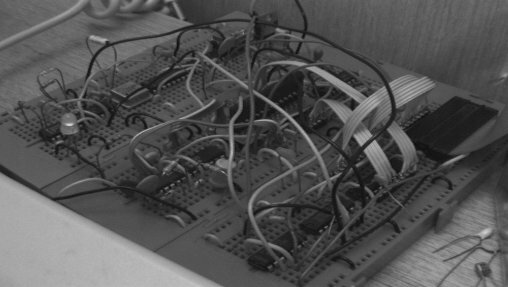 This video digitiser is a fairly advanced project, and it is therefore assumed that anyone considering building it has some substantial experience of electrical and electronic techniques. I have applied reasonable care in the design and preparation of the circuitry, diagrams and descriptive material, and have endeavoured to point out any particular hazards that might be relevant. Nevertheless, it is always possible that mistakes or omissions have been made: you take ultimate responsibilty for all consequences of building this project. A computer is an expensive piece of equipment! It is highly advisable to experiment using a parallel port on a (cheap and replaceable) I/O card than one built onto the motherboard - though be sure to realise this precaution still does not make your PC 100% invincible. Most of the IC's used in the design are CMOS parts and can easily be damaged by static electricity (as can the parallel port itself). Take all the usual ESD precautions when constructing the circuit. Avoid modifying the circuit while it is plugged in to the computer -- if you insist on doing so, then be absolutely sure to earth yourself (eg by touching the metal case of your computer) immediately prior to every adjustment. Do not insert or remove any IC from the circuit while power is applied. It is general good practice not to interconnect or disconnect separate pieces of electronic equipment while the power to any device is on. This is especially important if you are taking your composite video feed from a source, such as a television set, which is "double insulated" (not earthed). Due to faults/ageing of the TV power supply, its low-voltage circuitry, including the chassis 0v (ie the case/screen/0v of the phono/BNC/SCART sockets) can in reality be resistively or capacitively coupled to the mains, often enough to give a mild tingling in the fingers if touched! If the TV is connected via the phono/BNC/SCART socket to something else which is earthed, such as a video recorder, or the digitiser (earthed via the computer), the TV will be indirectly earthed via the signal cable: this is not an ideal situation, but does not normally cause any major problems. However if, with all power applied, you were to unplug that connection, and just say the 0v connector came apart before the signal (video/data etc), you could now be feeding 240Vac down that signal line - potentially OUCH for all equipment concerned! Since the video signal is probably terminated by a low value resistor at both pieces of equipment, that will probably survive. But if your digitiser hardware is on a floating power supply and becomes high-voltage via your TV, connecting the digitiser to the computer could be a bad move. If you are going to make interconnections with the power on, always connect the digitiser circuit to the PC first, then connect to the additional equipment (TV) last. For disconnection, do the reverse: disconnect the TV first. Worthwhile additional protection is gained by ensuring the sheilds of your D-connector shells are not left floating, but are connected to the cable screens where appropriate, and then the chassis of the socket on your digitiser is connected to your circuit ground (0v). That way, when the circuitry is plugged into the parallel port, any high voltages (or charges) present on the whole circuit should discharge harmlessly through the sheild (which should mate first) instead of through a data pin (ouch!). You should check my diagrams and be sure in YOUR OWN MIND that everything is safe, similarly check any physical circuits you build against the diagrams BEFORE plugging in and/or applying power. A (16-bit) application to capture the images is available: videodig.exe [68kB]. Download, save, and run it. This first release is permanently configured to use the parallel port at base address 0x278 (usually LPT2). It is also permanently set for 840 pixels per line. This program should run on Win31, Win95/98, and WinNT4 platforms. The complete source code for the above application is also available: vidisrc.zip [10kB]. It was written using the old (Borland) Turbo C++ v3.1 for Windows 3.1 compiler - which will be required to compile it in its entireity. If you want to write your own software from scratch, the following extracts from my C++ source code should show all the important steps you need to get started. // Collects ONE FIELD at a time from MSM518221 frame buffer IC. See Software PAL/NTSC decoding page. Includes downloadable software!